I am a 60 year old woman, and after being made redundant, decided to take up a hobby. I was always interested in cake decorating so I started to look at websites. My interest has grown from there. My niece asked me if I would make her wedding cake to which I replied, "You tell me what colour you want, and if you want a round or square, and leave the rest to me. This is the design I made for her. When she saw it she started to cry. She said it was the most beautiful cake that she had ever seen. Needless to say, I was overjoyed that she trusted me enough to do something that meant so much to her. This has given me a huge boost and I can't wait to try out some more baking and decorating. Dapne, your cake is amazing. It's hard to believe it is your first time. Can you tell us what you made the butterflies out of? I am assuming that they are royal icing. Could you also tell us more about how you decorated the sides of the tiers? 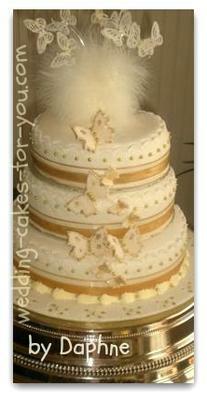 Thanks so much for sharing this beauty of a butterfly cake. I'm glad you discovered baking and decorating as a hobby, but you certainly could be a professional. The butterflies were made out of gum paste,the sides I did with a quilting tool while on the cake, then filled with butter icing to do some piping. When the butterflies dried I hand painted them and then added some glitter using edible glue. I got my recipe for carrot cake from your site. Thanks Daphne. That is helpful.